It’s a hard job finding the perfect hoof on a racehorse, a New Zealand study suggests. A research team from Massey University wanted to learn more about front hoof conformation and the prevalence of flat feet in New Zealand Thoroughbred racehorses. They noted that 85 percent of the musculoskeletal injuries reported during race training involved the front legs, with more than four out of five of them centered on the lower leg. Wilna Labuschagne, Chris Rogers, Erica Gee, and Charlotte Bolwell, in a paper accepted for publication in the Journal of Equine Veterinary Science, noted that racehorses in New Zealand mostly trained counter clockwise. This training pattern, they said, had been linked to differences in bone density in the front legs and uneven limb loading. However, there was limited information available on hoof conformation in these horses. The study team assessed the lower front legs and collected hoof conformation data on 75 Thoroughbred racehorses housed in two training yards. They were mostly aged 2–5. Hoof conformation and the lower legs were subjectively assessed, and multiple hoof measurements were made with a modified tyre gauge to record the depth of the sole and the sulcus – that’s the cleft at the back of the frog. Digital photographs were taken to help in the grading. All horses in the study had been shod by registered master farriers an average of 15 days before the measurements were taken. Dealing with the lower legs separately from the hooves, few anatomical abnormalities were noted. The most common abnormality was mild fetlock valgus – displacement away from the midline – in 10 legs across 10 horses. One third of the horses had deviations in the hoof pastern axis. Dealing with the hooves, more than 80 percent of the horses – 62 of the 75 – presented with some deviation from normal parameters. 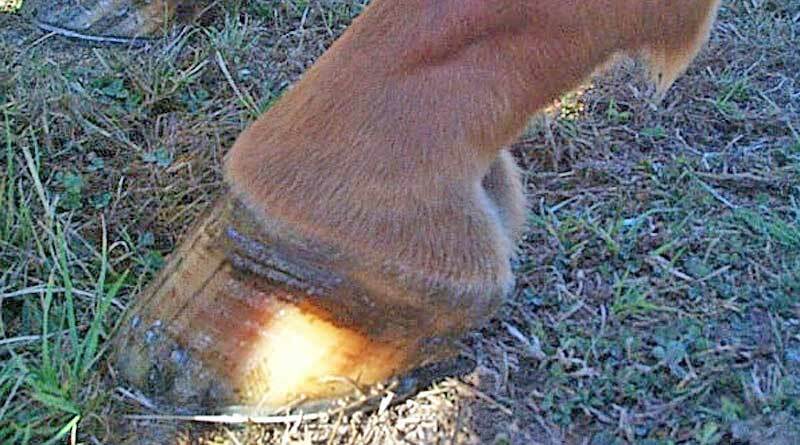 The most common hoof abnormality was unevenness in the sulcus, identified in 43 horses, affecting 59 front hooves. This was followed by a higher medial (inside) hoof wall height in 38 horses, with 53 affected hooves in all. The length and width measurements increased with horse age, the study team reported. The ratio of the dorsal (rear) hoof wall length to heel-length was consistently less than 3:1, and the absolute difference between toe and heel angle was generally greater than 5 degrees. Between-limb hoof variations were identified for several physical measurements, including frog length, sole length and the ratio of sole width to sole length. Flat feet – the lack of a concave underside – were identified in 28 percent of the horses, with 21 animals having a total of 28 flat feet. More horses had a flat left foot (10 of the 75) than right foot (4 of the 75), but seven horses had both feet classified as being flat. Flat feet were 2.4 times were likely to have uneven sulci. The unevenness in measurements between limbs may reflect the greater loading of the left front leg when race training counter clockwise, the researchers suggested. Discussing their findings, they observed: “All the horses in the study population were actively in work (either race training or pretraining) and this implies that the limb and hoof conformation observed represents a functional foot for the given demands of race training, particularly for older horses that have been through several racing preparations. The asymmetry observed in the study was mild, they reported, and the prevalence of left to right asymmetry was 18% − higher than that reported in a population of Dutch Warmblood horses, at 8%. This possibly reflected differences in the criteria and level of asymmetry assessed. Some level of asymmetry must be biologically normal and associated with horse-level laterality and bias, they suggested. The prevalence of flat feet was lower than expected given widespread anecdotal reports of flat shallow feet in Thoroughbreds. The researchers are all with the Equine Research Centre, part of the Institute of Veterinary, Animal and Biomedical Sciences at Massey University. Labuschagne W, Rogers CW, Gee EK, Bolwell CF, A cross-sectional survey of forelimb hoof conformation and the prevalence of flat feet in a cohort of Thoroughbred racehorses in New Zealand, Journal of Equine Veterinary Science (2017), doi: 10.1016/j.jevs.2016.11.013. Had a TB here in the USA that came off the track with awful feet, under run, shelly, no frog. Started off with a master farrier to shoe him with terrible results. After some considerable time with no improvement changed my farrier to a young chap with no qualifications except that he had shod TB’s at the track. He had the feet in perfect condition in no time flat. He told me that the way track farriers were shoeing was a large part of the problem. coupled with the fact that breeders needed to pay more attention to the correctness of feet on breeding mares and stallions.